The Intune subscription lets you manage devices over the internet. This includes specifying which user collection can enroll devices and defining information presented to users. While creating the Intune subscription, you can also add company branding to the Intune company portal with your company logo and custom color schemes. 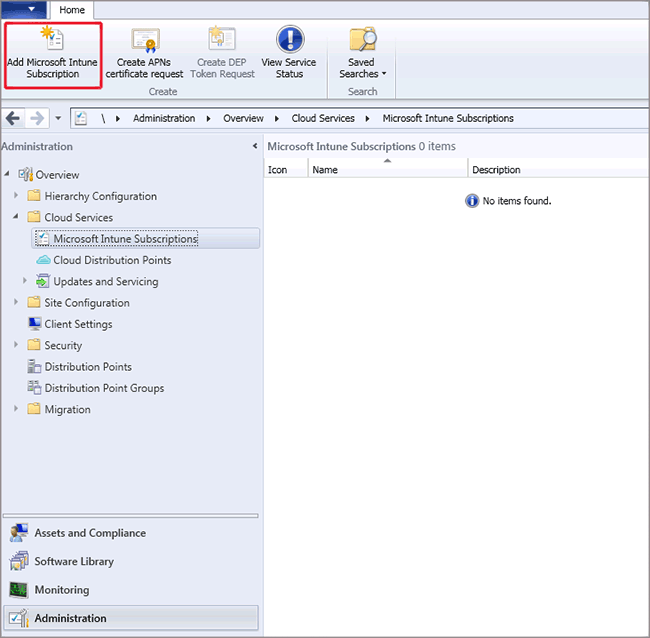 Creating a subscription for Microsoft Intune in Configuration Manager will put your site's service connection point in "online mode." See About the service connection point in System Center Configuration Manager. If you haven't already, sign up for a Microsoft Intune account at Microsoft Intune. After creating your Intune account, you do not need to add any users to the Intune account or perform additional settings configurations. In the Administration workspace, expand Cloud Services, and click Microsoft Intune Subscriptions. On the Home tab, click Add Microsoft Intune Subscription. On the Subscription page, click Sign in and sign in by using your work or school account. In the Set the Mobile Device Management Authority dialog, select the check box to only manage mobile devices by using Configuration Manager through the Configuration Manager console. To continue with your subscription, you must select this option. Once you select Configuration Manager as your management authority, you can only change your management authority to Microsoft Intune in Configuration Manager version 1610 or later and Microsoft Intune version 1705 without having to contact Microsoft Support, and without having to unenroll and reenroll your existing managed devices. For details, see Change your MDM authority. Collection: Specify a user collection that contains users who will enroll their mobile devices. If a user is removed from the collection, the user's device will continue to be managed for up to 24 hours when the user record is removed from the user database. URL to company privacy documentation: If you publish your company privacy information to a link that is accessible from the Internet, provide a link that users can access from the company portal, for example http://www.contoso.com/CP_privacy.html. Privacy information can clarify what information users are sharing with your company. Color scheme for company portal: Optionally, change the default color of blue for the company portals. Configuration Manager site code: Specify a site code for a primary site to manage the mobile devices. Changing the site code affects only new enrollments and does not affect existing enrolled devices. On the Company Contact Information page, specify the company contact information that is displayed to users under Contact IT in the Company Portal app. Provide contact information for your company, and then click Next. On the Company Logo page, you can choose whether to display logos in the company portal, and then click Next.